Born on the beach and raised on fishing boats, Simon’s affinity for technology is somewhat unexpected. He hasn’t spent his life studying or working in big tech. Instead, what drives Simon is his deep curiosity for making things work. Better. Faster. Cheaper. His ability to make the abstract accessible is his advantage, he can turn a technophobe into a digital native in just a few clicks. Self-proclaimed as inherently lazy his intent is to use technology to make his life and the lives of those around him easier so they can get on with the work and play that really matters. His clients include multinational organisations such as John Holland, AMP, Bank of Queensland and OpenText, industry associations such as CPA Australia and The Law Society as well as government agencies and departments. The breadth of impact that digital technology is currently having on organisations means that his work, and his keynotes, are applicable across a huge variety of audiences. 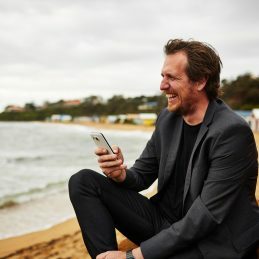 Rather than just amuse and entertain, his keynotes provide a deeper level of insight into the impact of digital technology on people at work. He gets audiences to question the status quo and find opportunities for meaningful improvement in how they work. His sessions are especially relevant for skeptical audiences who want insights and advice on what they can do today, rather than just being inspired by what might be possible tomorrow. We all know that thinking strategically about IT means more than just pinning vision statements to the wall and conceiving an endless stream of cascading goals and objectives. But given the disruptive changes we are currently seeing in the digital landscape perhaps the whole model of IT delivery requires a rethink. The right set of apps in the right hands can dramatically improve productivity and personal effectiveness…but with over one million apps on both the Apple and Android app stores it is difficult to know where to start. It is no wonder that we are constantly seeking out app recommendations from friends and family (and even the Qantas magazine), but just for once it might be nice to get recommendations from someone actually qualified to do so. Keynote #4: Can technology make us more human? We are constantly being blindsided by technology. Activities that were previously considered the sole domain of humans such as driving vehicles and helping diagnose cancer are now being done (often more successfully) by machines. As the rate of technology-driven change continues to increase a very legitimate question arises: what type of work will be left for us? The breadth of impact that digital technology is having on society is quite positively…huge. And although there are common threads, themes and ideas, the experience your organisation is having will always be somewhat unique. Sometimes it just requires a different perspective to help make sense of it all.